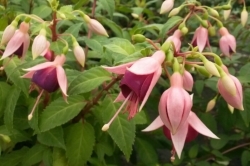 The fuchsias listed in this section should prove hardy throughout the UK when planted in the ground - not in pots. Plants should ideally be grown on into a minimum of a 3½" pot before being transplanted to the garden and need to be established in the garden for a good couple of months before the first frosts of winter can be expected. For best results leave the dead wood on the plant over winter and cut it back hard in spring after the last frosts have passed. Please note that the heights listed below are an approximate guide only. Growth 1½-2 ft. Tube and sepals light cerise, corolla rosy lilac. Growth 1-1½ ft. Tube and sepals rose, corolla white veined rose. Growth 3-3½ ft. Self-coloured bright pink flower. Growth 3-4 ft. Tube and sepals deep carmine, corolla blue-violet veined pink. Growth 1-1½ ft. A sport from Lady Thumb with variegated green and cream foliage. Tube and sepals light carmine, corolla white. Growth 3-4 ft. Good upright growth, tube and sepals pale pink, corolla tangerine pink. Growth 1-1½ ft. Tube and sepals deep pink, corolla white veined pink. Growth 2-2½ ft. A very easy floriferous variety. Tube and sepals deep pink, corolla bright mauve. Growth 2-2½ ft. A sport of 'Beacon', self coloured light rose. Growth up to 2½ ft. Tube and sepals flesh pink, corolla bright aubergine. Growth up to 3 ft. Tube and sepals red, corolla purple. Suitable for small hedges. Growth up to 2½ ft. Tube and sepals neyron rose, corolla flushed pink.